Note: The Ron Lewis Automotive Group's 100,000 Mile Certified Limited Warranty offered on eligible used vehicle inventory provides power-train coverage up to a total of 100,000 miles on the vehicle's odometer. This warranty covers engine and transmission repairs, all internally lubricated parts contained within the transfer case and drive axle repairs. All repairs and maintenance are to be completed at any Ron Lewis Automotive Group location. See www.ronlewisautomotive.com or contact any Ron Lewis Automotive Group location for details. We Love Our Internet Customers! Print this Listing and Present to MIKE MONROE -- Waynesburg Dodge Chrysler Jeep's Internet Sales Manager to Receive $100 SAVINGS any New or Used Vehicle! 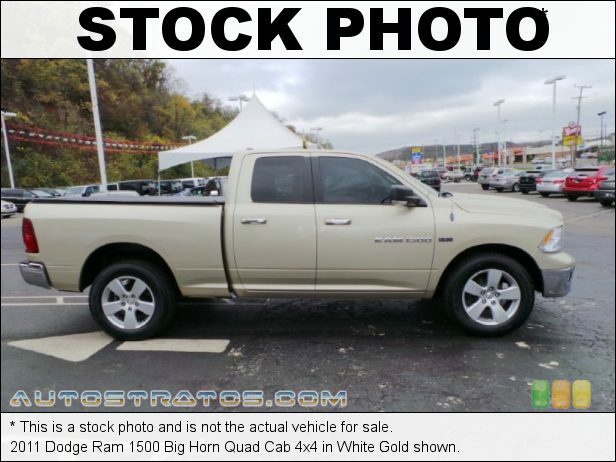 White Gold 2011 Ram 1500 Big Horn 4WD 5-Speed Automatic HEMI 5.7L V8 Multi Displacement VVT 20" x 8" Aluminum Wheels, Ash Tray Lamp, Auto-Dimming Exterior Mirrors, Auto-Dimming Rear-View Mirror, Big Horn Regional Package, Bighorn Badge, Black Exterior Mirrors, Bright/Bright Billets Grille, Class IV Receiver Hitch, Dual Rear Exhaust, Exterior Mirrors Courtesy Lamps, Exterior Mirrors Heating Element, Exterior Mirrors w/Supplemental Signals, Fog Lamps, Glove Box Lamp, Halogen Quad Headlamps, Leather Wrapped Steering Wheel, Luxury Group, Overhead Console w/UGDO, Power Heated Fold-Away Mirrors, Quick Order Package 26Z Big Horn, Rear Dome w/On/Off Switch Lamp, Remote keyless entry, Steering Wheel Mounted Audio Controls, Sun Visors w/Illuminated Vanity Mirrors, Underhood Lamp, Universal Garage Door Opener. Recent Arrival! Odometer is 26861 miles below market average!